CES provides us the opportunity to look at the latest and greatest products in each technology vertical. Our NAS coverage started with Asustor's AS4000 series last week. 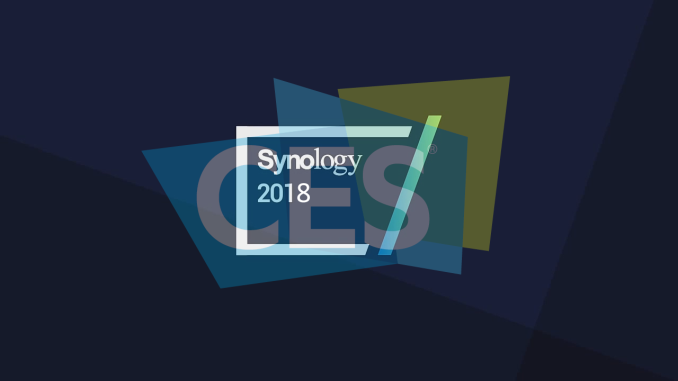 Today, we will take a look at the updates from Synology. While there was only one 'new' hardware product introduced during the course of CES (the Rangeley-based 1U 4-bay RS818+/RS818RP+, along with a 4-bay RX418 expansion unit), the software updates turned out to be much more interesting. 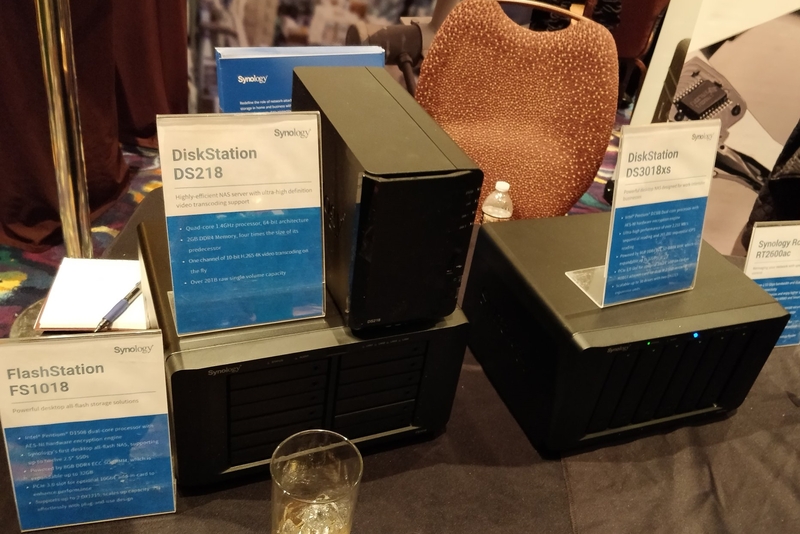 Synology demonstrated three major packages. Synology already has a great photo backup and viewing package in Photo Station. By combining it with the traditional PC backup process and the DS Photo mobile app, it became an effective tool to manage albums. 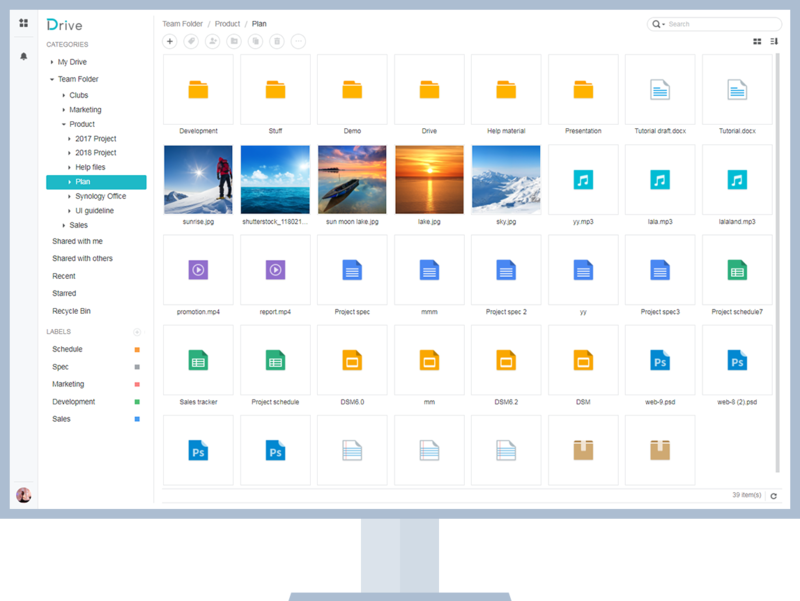 Synology is adding Moments, a completely new application, that allows users to backup, organize, and sort their photographs. 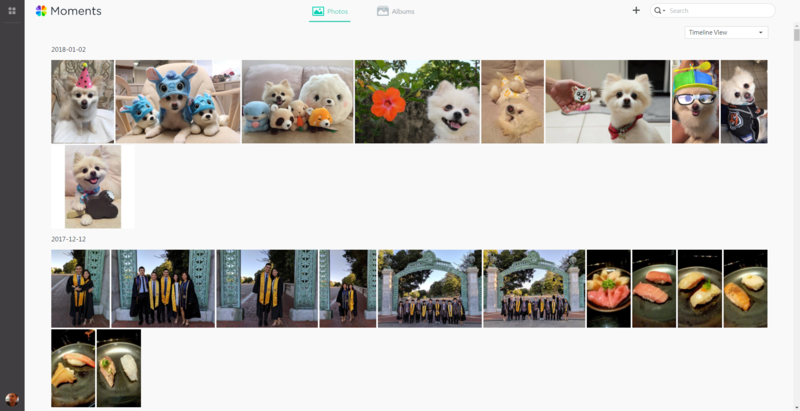 Synology claims that the deep learning and automatic organization tools that are part of Moments allow it to identify various aspects of the photos and sort them into albums automatically during the indexing process. Moments will also come with a separate mobile app to enable easy backup of daily photos. I have found this aspect of Google Photos to be incredibly useful, and it is exciting to see something similar come without any associated privacy concerns. Synology's official page for the Moments feature indicates that some of the deep learning features are available only on models with powerful CPUs. Synology is launching Drive as a revamped version of the existing Cloud Station suite. It would not be wrong to say that the multitude of 'Cloud' packages such as Cloud Station Server, Cloud Station ShareSync, Cloud Station Backup, and Cloud Sync only ended up confusing the average user. Synology is betting on the new Drive package to act as a single portal for all of the file management and syncing needs. There is an emphasis on team collaboration, with the Office feature (discussed below) using the Drive as the hub. Desktop and mobile clients ensure that users / teams can have access to the files in an organized manner from any device. It also has basic synchronization functionality (in effect, a private Dropbox-like feature). The universal search feature helps users to quickly find relevant documents and files. Synology has been making an effort to extend the functionality of their NAS models by providing typical business productivity applications with a multi-user focus. Synology users had two packages - Documents and Spreadsheets - to replicate the functionality of online browser-based real-time collaborative office tools. A presentations package, Slides, is being added now. The Drive package is used as the management front-end for all the Office tools. DS218 (PDF): Based on the Realtek RTD1296 with a quad-core Cortex-A53, this 2-bay value-series member allows 4K transcoding on-the-fly. It also supports snapshots (a first for the ARM-based Synology value series). DS3018xs (PDF): Based on the Intel Pentium D1508 Broadwell-DE SoC (dual-core), this 6-bay desktop NAS can be scaled up to 30 bays. It also has two internal M.2 slots, 4x GbE ports, and supports an optional 10GbE card. FS1018 (PDF): Simlar to the DS3018xs, the FS1018 is also based on a Pentium D1508 SoC, has four GbE ports, and supports an optional 10GbE (or M.2) PCIe card. However, it is a 12-bay unit (scalable to 36 drives) and supports 2.5" drives only. It is meant to be used with SSDs - targeting applications that require very high performance. In addition to traditional RAID modes, the FS1018 also supports RAID F1 (PDF) - a scheme that distributes parity blocks unevenly so that all the SSDs in the NAS do not get worn out at the same time. Overall, the software updates (both packages and core features in DSM 6.2) are very interesting and useful, with RAID F1 being an interesting approach to an all-flash NAS. On the hardware side, we are surprised to see Synology still introducing models with 4-year old SoCs from Intel. While we did see Intel's Apollo Lake in models such as the DS218+ and DS418play, the SMB / SME market is still being served by Rangeley (Atom C2538 in the RS818+) and dual-core Broadwell-DE SKUs (Pentium D1508 in the DS3018xs / FS1018). 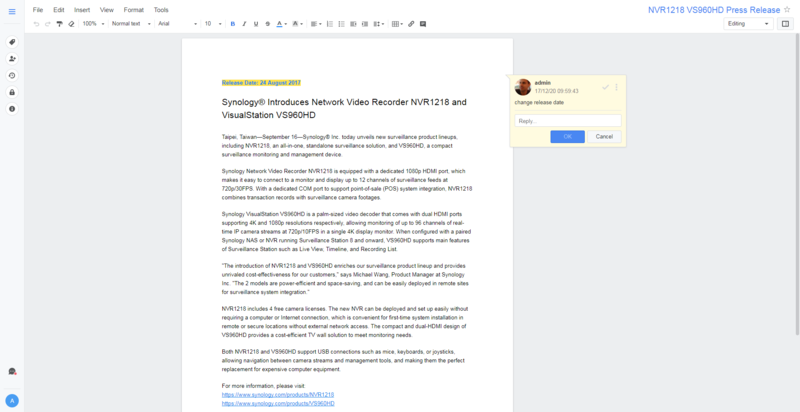 With the official release of Virtual Machine Manager, it would make more sense for Synology to release more powerful hardware for SMBs / SMEs in order to enable running of resource-intensive guest operating systems. Finally, we asked Synology about their response to the Meltdown / Spectre security issues. They already have a security advisory page, and categorize the risk as moderate. Given the relatively closed nature of DSM, we believe that users should not be at risk as long as they are running trusted packages only, and steps have been taken to ensure no unauthorized access to the NAS. Meanwhile all their Atom C2538 based units are failing at a rapidly increasing rate and their "fix" is to refurbish the affected units with a resistor that *should* make the CPU last long enough until the warranty expires. Current RMA time 4 weeks or more. While I agree that continuing to use the C2000 series is a bad choice, I do not think that 'refurbishing affected units with a resistor should make the CPU last long enough till warranty expires'. The reason is: once the unit is affected, the internal transistor is kaput. There is no way they can bring it back. If they have a older board that has NOT been subject to 24x7 operation / powered on rarely, the transistor is not degraded. The resistor workaround will prevent the damage to the internal transistor. I believe almost all of the RMAs for the C2000-based units should be because of the boot-fail issue. And, I am sure they will not have enough boards from the other RMAs to use for replacing the ones that come in due to the boot-fail. It is more likely that the resistor workaround is applied to boards that were manufactured earlier, but never shipped (or powered on for extended duration). I don't have any additional information, I'm just a somewhat disappointed costumer as our small business relies on a DS1515+ for smooth day-to-day operation and we're about to wait a whole month to receive a unit with the same B0 stepping and a board level fix that looks somewhat questionable to me as a layman. I am going to have to order a replacement device before the RMA and use the 1515+ as a cold spare unit. Wow, as I was reading the article, I was kicking myself yet again for buying the DS1515 instead of the DS1515+ just to save a bit of money.. But now I feel totally relieved. So thanks for that. >No plug in NAS can beat a properly configured FreeNAS. Except in WAF. Or ease of use for non-techies. Or simple replacement of drives. Or migration of drives in the event of a hardware failure. Or price. Or price/performance. Or speed of configuration. Or noise. Or power consumption. etc, etc. Yes, a properly configured FreeNAS box will outperform a plug-in NAS, in general, but "beating" implies you only care about performance and not any of the other things which make plug-in NASes worthwhile. I wouldn't want my small business customers to have to figure out how to admin a FreeNAS box in order to have a place to dump their backups. Nor would I want to hammer them with my time costs in order to configure it for them. Why not? Because then they wouldn't bother backing up, and then when it all goes base-over-apex you know who'll get the blame.